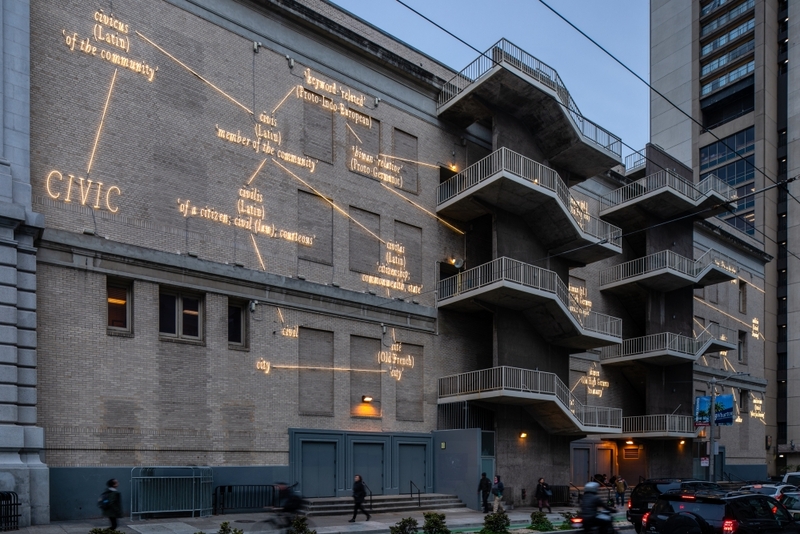 The San Francisco Arts Commission places a new sight-specific neon artwork on the western façade of the historic Bill Graham Civic Auditorium by internationally acclaimed conceptual artist Joseph Kosuth. W.F.T (San Francisco) presents the etymology, or “Word Family Tree”, of ‘Civic’ and ‘Auditorium’ in white neon. Through the use of language, Kosuth’s artwork reflects the historical significance of the Auditorium while also demonstrating how words reveal relationships to cultural and social realties. W.F.T (San Francisco) is Kosuth’s first permanent public artwork on an historic building in the United States. It is also the City’s first public art project funded by a private developer, Emerald Fund, through the Public Art Trust. Kosuth typically works in an architectural context and his work can be found in significant historic buildings around the world including the Louvre in Paris. When conceiving of W.F.T (San Francisco), the artist considered the role the Auditorium has played in San Francisco history, from its inauguration in 1915 as part of the Panama–Pacific International Exposition to hosting psychedelic rock concerts in the 1960s to the present. The etymological origins of the words provide meaningful and coincidental associations with recent landmark public policy such as the legalization of gay marriage. The structure of this installation has two parts: the etymology of the words ‘Civic’ and ‘Auditorium’ in white neon on the western façade. The word ‘Civic’ is intricately connected to the long history of civil rights activism that has taken place (and continues to take place) in the plaza–from Gay Rights to Black Lives Matter. The word ‘Auditorium’ on the other hand is more specific to the building itself, referring to the collective audience assembled by Bill Graham, who found a way, as a concert promoter to not only promote concerts but also community. It is only in the present when a word is used, as it is with a work of art being experienced, that all which comprises the present finds its location in the process of making meaning. Here, in this work, language becomes both an allegory and an actual result of all of which it would want to speak.